Through dialogue between pianists and the pianomakers and craftsmen at C.Bechstein Germany C.Bechstein created the B212. The C.Bechstein B212 grand piano is a grand piano for the professional connoisseur and ambitious player who wants the best of the best. By using the exact same re-designed successful features possessed by concert grand pianos C234 and D282 the C.Bechstein research and development department developed the B212 grand piano. This grand piano has the highest musical quality. It has a wonderful touch and finest sound. It is simply a masterpiece. Technically the B212 is made with top German expertise. The highest mastery is applied to energy conserving for the sound to unfold and develop beautifully as well as to optimal tension in the right place. For instance to increase the soundboard elasticity the gluing in the soundboard is done after the outer rim has been glued around the inner rim. Did you know the soundboards of the C.Bechstein masterpiece grand piano series are vibrating tone membranes that lets every sound become a lasting experience. As C.Bechstein puts it the ”sound opens like a blossom”. Moreover through C.Bechstein Germany’s innovation and masterful piano making knowledge the cast iron plate has been redesigned to optimise the sound duration and the energy. Seven to nine quality wood layers for the pin block allow for an even finer torque quality. 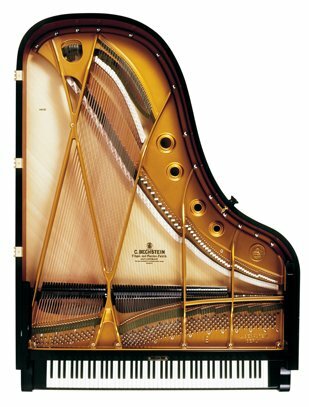 The C.Bechstein B212 grand piano is manufactured by C.Bechstein Germany with the highest quality in every detail. C.Bechstein does not compromise in quality. Please visit us at one of our showrooms to discuss prices and be delightfully assisted in purchasing this first class piano.